^ 采用AMD加速处理器的主流台式电脑. 超威半导体. 超威半导体. [2013-06-23]. ^ 采用AMD加速处理器的笔记本. 超微半导体. 超微半导体. [2013-06-23]. ^ 采用 AMD 加速处理器的平板电脑. 超微半导体. 超微半导体. [2013-06-23]. ^ AMD A系列一体化处理器（APU）——“一个顶俩 ”. 超微半导体. 超微半导体. [2013-06-23]. ^ Stokes, Jon. AMD reveals Fusion CPU+GPU, to challege Intel in laptops. Ars Technica. February 8, 2010 [February 9, 2010]. （原始内容存档于10 February 2010）. ^ AMD’nin 2012 için planladığı yeni nesil Fusion platformları detaylandı. Donanimhaber.com. [2012-08-22]. ^ AMD Trinity Desktop APU Specs Revealed. Cpu-world.com. [2012-08-22]. 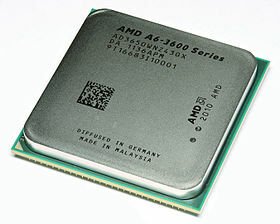 ^ AMD reveals its 2012-2013 roadmap, promises 28nm chips across the board by 2013. Engadget. 2012-02-02 [2012-08-22]. ^ AMD Catalyst 12.11 Driver Performance Never Settle. ^ Hruska, Joel. Manufacturing bombshell: AMD cancels 28nm APUs, starts from scratch at TSMC. ^ “Use of the terms “AMD” and “AMD Fusion””, 18 December 2012. Retrieved 28 January 2013. ^ 24.0 24.1 24.2 24.3 24.4 24.5 24.6 THE PROGRAMMER’S GUIDE TO THE APU GALAXY. ^ 28.0 28.1 28.2 28.3 28.4 AMD Outlines HSA Roadmap: Unified Memory for CPU/GPU in 2013, HSA GPUs in 2014. ^ 29.0 29.1 AMD Fusion Architecture and Llano. ^ 根据AMD的说法，它们计划每年都会发布新的AMD APU，新的A10 APU系列将面向比A8更高性能级别的电脑，新的A8 APU将面向以往A6 APU的主流市场。见：as portrayed in this APU roadmap document。2012年AMD发布了新一代AMD APU的旗舰型号A10-5800K，核心代号“Trinity”，CPU核心的性能比上一代AMD APU的旗舰型号A8-3870K高出20%~30%，而GPU核心的性能则有30%~50%的性能增长，其中GPU核心从原来基于AMD Radeon HD 5000/6000系列显示核心的5-VLIW SIMD架构升级到效率更高和性能更强的AMD Radeon HD 6900系列（核心代号“Cayman”）显示核心的4-VLIW SIMD架构，并且将制程从40纳米提升到32纳米，见：this article. ^ 31.0 31.1 AMD’s 2nd Generation APU, Codenamed “Trinity,” Will Enable Superior Multimedia Experience for Our “Connected” Generation. （原始内容存档于2013-04-07）. ^ CPU + GPU = APU: East Meets West.